When using alloy wheels, you should re-tension the wheel studs after approximately 200 kilometres of use, since the materials adjust to each other during operation. The re-tensioning should be performed with a torque wrench and the correct torque should be applied. Standard steel rims do not require re-tensioning. You should measure the inflation pressure of your tyres regularly, approximately once every three weeks. If the pressure is too low, fuel consumption will increase and driving safety will be affected. You can find the correct tyre pressure in the vehicle’s manual. When the car is heavily loaded, you need to increase the tyre pressure by 10–15 per cent. For measuring inflation pressure, you should purchase a low-cost tyre pressure gauge from a spare parts shop and calibrate it with the meter used by a tyre shop. - For example, you can have the tyre shop fill your tyres to the correct pressure and then check what your own gauge is showing and write this figure down. This way, you will have your own calibrated gauge that makes it easy to check the inflation pressures, Morri explains. Every now and then, you should remove large stones from the tyre’s main grooves. Rocks that are firmly wedged into the grooves will not fall out while driving; instead, they will penetrate deeper into the tyre and may cause tyre damage. Rocks can be removed from the larger main grooves with a key ring, for example. - Smaller rocks are usually ejected while driving, which means that they can be ignored. Rocks that are caught in the brake disc shield may be noisy, and they sometimes need to be removed by a tyre shop, Morri states. If your car has a spare tyre, you should check its pressure and groove depth at the beginning of the season. Just in case, you should also keep the inflation pressure of the spare tyre at a higher level, since it tends to decrease over time. In newer cars, the spare tyre is replaced by a repair kit that includes a sealant bottle and a small air compressor. Remember to keep them in the car and study how they work. A good way to keep your tyres in shape for longer is to rotate them regularly, either once every 8,000 kilometres during normal driving or when the tyres have a difference in wear of 2 millimetres. For example, when a front-wheel drive car has 6 millimetres of tread on the front tyres and over 7 millimetres in the rear, you should rotate your tyres from front to back and vice versa. This will even out the tyre wear. 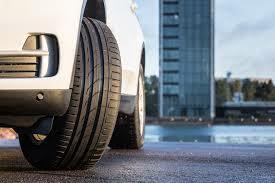 - For summer tyres, you should pay special attention to the wear pattern. Now that the tyres have been changed recently and the roads are still rough from the winter, tyre wear is faster than normal. If the car has a steering angle problem, this will affect tyre wear, and the tyre can wear out more in the shoulder area than in the centre. Uneven tyre wear is a sign of the wheel angles requiring adjustment, Matti Morri states.